We’ve created a A Guide to Creating Facebook Adverts. Facebook advertising is one of the most cost effective forms of online advertising available. If done properly it can yield fantastic results. Since Facebook started making changes to their news feed algorithms back in 2011, it has become increasingly hard for businesses to achieve results organically. Facebook advertising campaigns have now become an integral part of the social media marketing strategy for many businesses. If you are new to Facebook advertising it can be a bit of a minefield, from choosing the right campaign objective to defining an audience and setting a budget. Our guide to creating Facebook adverts will give you an understanding of the basic features to allow you to get your adverts up and running. So, first things first let’s take a look at the different campaign objectives. 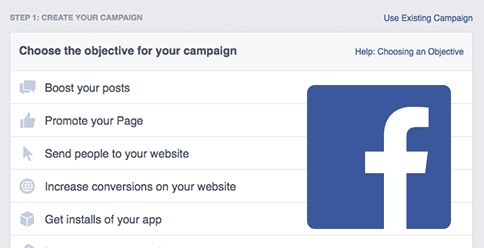 When you click create an ad within the ads manager on Facebook, the first question you are asked is to choose your campaign objective. Understanding the difference between these will help you choose the best objective for the campaign. There are 10 different objectives to choose from. The list includes everything from sending people to your website to getting installs of your app to raising attendance at your event. Boost your posts – used to increase the reach of specific posts to reach a wider audience. If you’re just starting out with paid advertising on Facebook, it’s likely that you’ll have to experiment with several different targeting options until you reach an audience that fits just right. Monitor the performance of each advert and audience definition to see what works best for you. If you’re looking to drive traffic or likes, you’ll probably want to focus on the type of people you know will be interested in your offering. However, if you’re looking to build brand awareness or promote a widely appealing offer, feel free to focus on a more general audience. Once you find a group that responds well to your ads, Facebook allows you to save these audiences to be used again later. Daily budget – if you want your ad set to run continuously throughout the day, this is the option you’ll want to go for. Using a daily budget means that Facebook will pace your spending per day. Keep in mind that the minimum daily budget for an ad is £1.00. Lifetime budget – if you’re looking to run your ad for a specified length of time, select lifetime budget. This means that Facebook will pace your spend over the time period you set for the ad to run. Once these parameters have been defined you will be asked to create the artwork and copy for your text. You can preview your advert in ads manager; it will show you a preview of how the ad will be displayed in the desktop news feed, mobile news feed, desktop right column and audience network. If you have any queries or questions about Facebook advertising or what Blackberry Design could do for your business, get in touch on 01527 517309 or fill in our contact form.